Looking for a high-quality flooring option that will be easy to care for in the coming years? Check out this Tokio 15mm Texas Oak laminate flooring from iDeal Floors. With laminate, you get the look of wood flooring without the hassle of real hardwood. These floors are incredibly durable and feature an AC4 rating (the highest laminate rating we carry). In fact, this type of flooring is resistant to stains, fading, scuffs and scratches. It's also super-easy to install and can be added over lots of different substrate types, including plywood, concrete and even vinyl flooring. 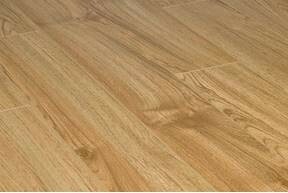 At 15MM, this is also the thickest laminate we carry, making it especially durable and long-lasting. This Tokio 15mm Texas Oak laminate flooring is an excellent example of why so many homeowners are turning to this modern flooring style. It looks like beautiful honey-colored hardwood, but its surface is much more durable. Better yet, the price is tough to beat. You'll find that adding new flooring is much more affordable than you may have anticipated when you choose laminate for your home. Make the smart choice in terms of style, maintenance and budget by ordering this Texas Oak laminate flooring by Tokio. For more flooring inspiration, check out our massive inventory that includes hundreds of flooring options in a variety of styles.